Every new member makes us stronger! 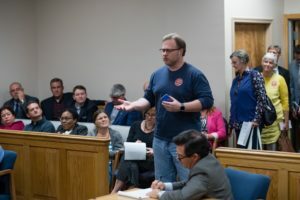 Solar supporter speaks at a local hearing. Our energy system is changing. This is an amazing opportunity to transform how we generate and use energy. When you become a member, you join a community of solar supporters that are fighting for more progress, sharing ideas, and celebrating our successes. We’re fighting arbitrary limits (net metering caps) on the number of people who can go solar. We support the expansion of programs like community solar so people that rent or live in condos can choose to get their electricity from solar panels in their neighborhood. 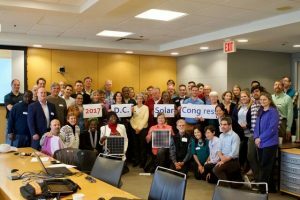 We launched a groundbreaking program bringing solar to low-income families in Washington, D.C.
Want to be a solar advocate? Our advocacy campaigns empower you give you to stand up for your solar rights. Spread the word about solar in your community. Contact lawmakers. Testify at hearings. We give you the support you need to make your voice heard. Solar Congresses are an opportunity for the solar community to come together. Attend a statewide Solar Congress, a public conference complete with informational presentations and a participatory open forum around the current and future state of solar. 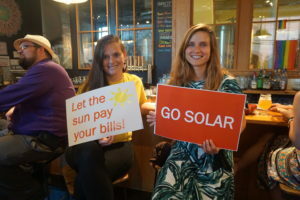 You’ll be able to connect with fellow solar supporters at meetings, open houses, social events, and movie screenings to learn what’s going on with solar in your state. Our listservs and forums let you interact with other solar supporters directly in your community and across the country. Access a directory of businesses that have gone solar in your area. From local breweries and markets to retailers and bed & breakfasts, find out what local businesses are being powered by the sun! Members receive discounts and coupons at participating businesses.